The 2019 Emerald Print Exchange registration opens in January, this year open to international as well as US entrants. All fine art printmakers are eligible, but participation is limited to 200, so enroll soon. Our missions with this project is to engage with printmakers near and far, to exhibit new works in Portland and Eugene, and to raise funds in support of Whiteaker Printmakers and Print Arts Northwest. Fine Arts Brigade and Whiteaker Printmakers are partnering with Tim Boyden's Out On A Limb Gallery in downtown Eugene to add another exhibit space for fine arts. FAB is now sponsoring a large portion of OOAL's south wall to display a monthly rotation of prints, paintings, photography, and other art forms. WhitPrint will also be using a portion of the wall to extend their own gallery exhibits from their studio location into the downtown area. The opening exhibit for the month of September is a selection of works by WhitPrint studio members. The exhibit includes two pieces by local painter Robert Canaga, shown in conjunction with his Smaller Works at the Whiteaker Printmakers studio gallery though October 11. Each month will bring a new display, ready to view before the First Friday Art Walk. Print Arts Northwest and Whiteaker Printmakers are excited to announce the Emerald Print Exchange! All fine art printmakers residing in the U.S. are eligible, but participation is limited to 200, so enroll soon. Our mission with this project is to engage with printmakers near and far, to exhibit new works in Portland and Eugene, and to raise funds in support of our non-profit organizations. To enroll or get more details, visit the Emerald Print Exchange page. Deadline to enroll: May 1, 2018. Call for printmakers: BIG INK is back! BIG INK brings its large woodcut revolution back to Whiteaker Printmakers for two days of printing, Saturday and Sunday, July 21 and 22, 2018. Selected artists will work together with BIG INK's Lyell and Carand to pull prints on WhitPrint's massive Trayle press. Artists are invited to submit a proposal before May 14, 2018 to participate in the event. WhitPrint is one of nine printmaking venues on BIG INK's 2018 cross-country tour, and was last visited by BIG INK two years ago. Check out BIG INK's pics and video of the 2016 event. 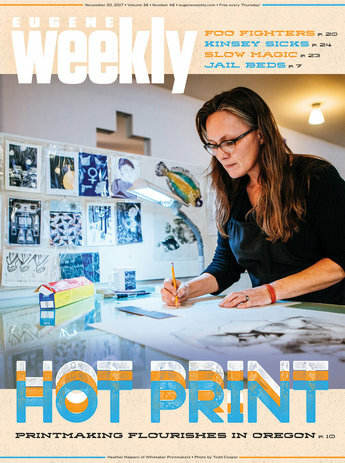 Yes, that is WhitPrint's Heather Halpern on the cover of this week's Eugene Weekly! Bob Keefer's article "Printmaking Explodes in Oregon" surveys the artists and the venues in the movement we're excited to be a part of. Whiteaker Printmakers is excited to welcome world-renowned printmaker Katsunori Hamanashi to Eugene! As part of a series of events hosted by White Lotus Gallery, this master of mezzotint will be speaking and demonstrating at the WhitPrint studio on July 26, 6-8 pm. Whiteaker Printmakers is hosting three letterpress workshops in January, 2017. Taught by Kristin Walker, the Saturday workshops offer instruction on using letterpress with linocuts, handset type, and photopolymer plates. Sign up now for one, two, or all three workshops! Whiteaker Printmakers' juried exhibition, "Pressing Matters 2016," opened August 2 at Emerald Art Center in Springfield, Oregon. The show runs through September 12, with a gallery reception on August 12, 5-8 pm. Whiteaker Printmakers, Eugene's member-supported community printmaking studio, hosted BIG INK for a weekend of large-format woodblock printing.